Cymap Mechanical is one part of our integrated suite of Building Services calculation programs. Working on its own, or in conjunction with our Psychometrics and electrical design software, Cymap Mechanical provides engineers with the tools to perform both routine and complex calculations quickly and easily. Our Mechanical software allows detailed analysis of all energy calculations associated with buildings such as space or zonal heat loss, cooling loads, energy consumption, interface with SBEM and plant modelling. The engineer can then design LPHW /chilled water pipe runs to ascertain pipe and pump sizing to all engineering standards. Plumbing and gas services to all standards can also be routed using the same techniques. Ductwork systems can be designed and routed on the model to determine all index run pressure drops to enable fan sizing using our unique and friendly sketching technique with fully rendered 3D views just a few clicks away. 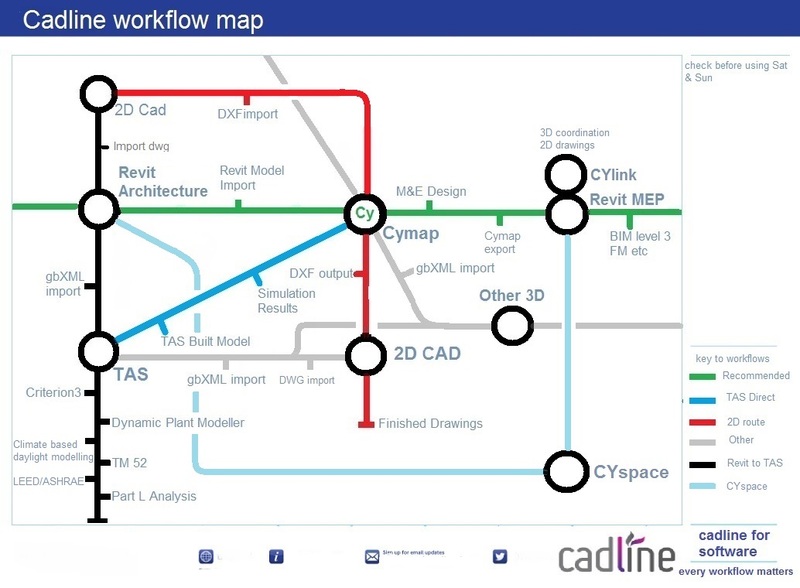 Cymap also forms part of the solution of Cadline’s products to realise BIM level 2 workflows. Building & Energy Programs: Enables the user to set up the building model either by introducing 2D floorplans and defining the room spaces manually, or import 3D gbXML geometry from Revit or other 3D building modelling software. This program also includes an extensive database of building constructions, that can be edited or added to based on full U value calculations to BS6946. 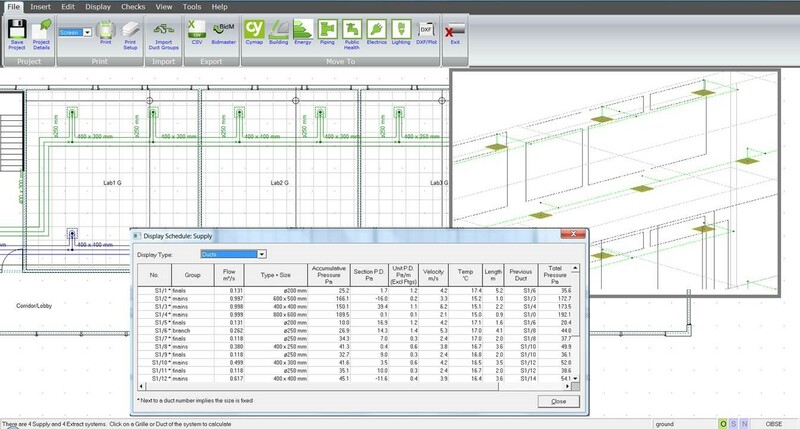 Engineering profiles can be added either from a database of NCM derived profiles, created, or imported from other previously engineered projects. Full shading calculations can be performed based on the building footprint and or other buildings surrounding the “target” building. Moving forward this then forms the basis of the development of the mechanical services within the building with full interoperability and consequential change filtering across the suite of programs. Simultaneous and or zonal Heat gains and losses can be derived using CIBSE steady state methodologies. Full linking with TAS dynamic simulation software enables importation of results if there is a requirement to do so. Export links to iSBEM is also included. Piping Programs: Enable the user to design and quantify LPHW/MTHW heating, chilled water, hot cold and gas services to current design standards including BSEN 806, BS6700, CIPHE and CIBSE demand methodologies. Simply sketch routing on the building model enables the user to establish the routes and subsequent sizing, pressure drop and quantity take-offs on a system by system basis. Valve and plant libraries provide symbolic representation along with technical data used mechanically and electrically. 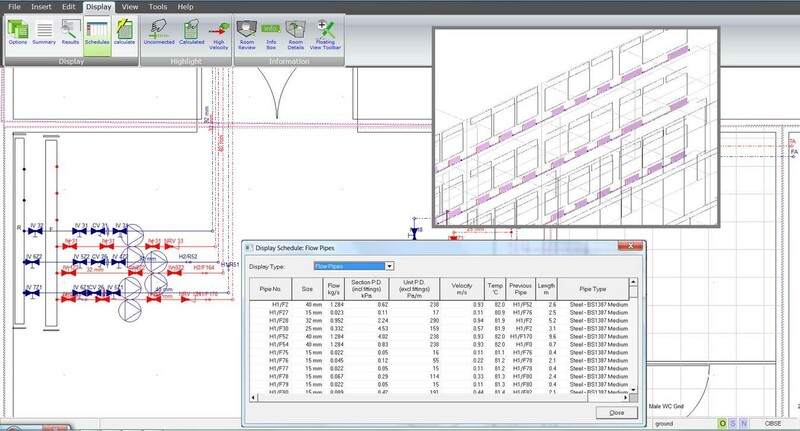 Ductwork Program: Enables users to derive and size supply and extract ductwork runouts on floorplans with all pressure drop calculations and bills of quantities included. Various duct fittings can be applied along with acoustic ductwork/fan noise calculations. Extensive databases of different shapes and sizes of ductwork to DW/144 are used with the ability to fix all ductwork attributes if necessary. 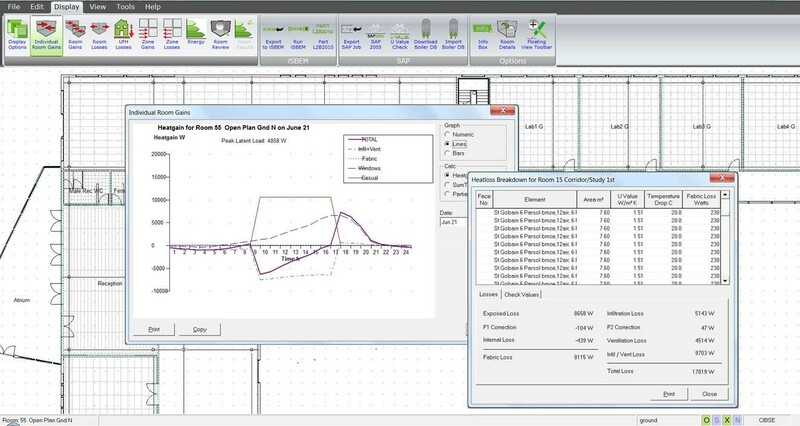 Psychrometric Program: Full psychrometric analysis of either proscribed systems or systems built up from a symbol library by the engineer enable detailed analysis of each part of the Psychrometric cycle. This allows the engineer to look at “free cooling” or heat recovery, values of which can be input into the Energy program to size local plant. Databases: All manufacturers databases have been provided and are open source to enable the user to add or edit their manufacturer libraries.